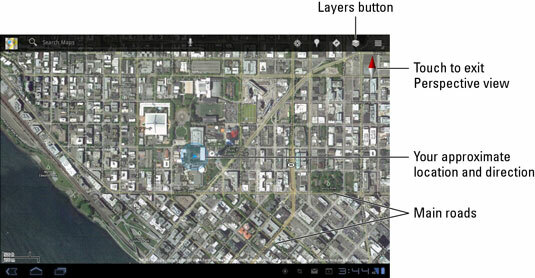 You add details from the Galaxy Tab Maps app by applying layers: A layer can enhance the map’s visual appearance, provide more information, or add other fun features to the basic street map, such as Satellite view. The key to accessing layers is to touch the Layers button. Choose an option from the Layers menu to add that information to the Map app’s display. You can add another layer by choosing it from the Layers menu, but keep in mind that some layers obscure others. For example, the Terrain layer overlays the Satellite layer so that you see only the Terrain layer. To remove a layer, choose it from the Layers menu; any active layer appears with a green check mark to its right. To return to Street view, remove all layers. Most of the features found on the Layers menu originated in the Google Labs. To see new features that may be added to the Maps app, visit the Labs by touching the Menu icon button in the Maps app. Choose Labs to pore over potential new features. The Galaxy Tab warns you whenever various applications access the Tab’s Location feature. The warning is nothing serious — the Tab is just letting you know that an app is accessing the device’s physical location. Some folks may view this action as an invasion of privacy; hence the warnings. If you’d rather not share location information, simply decline access when prompted.